The Punisher is back – with a vengeance! When a superhuman Civil War breaks out, Frank Castle finds himself square in the crosshairs of G.W. Bridge, a S.H.I.E.L.D. big gun who always gets his man. Frank should be lying low, but when spandex-clad bad guys start carrying badges…well, that’s something he just can’t abide. But can the Punisher play by Captain America’s rules? In the war’s aftermath, Frank infiltrates a super-militia bent on igniting a bloody race war – and led by a new Hate-Monger! With Bridge in hot pursuit, can the Punisher disrupt the National Force’s plans – or will he succumb to hate? Plus: An all-new look for the Punisher brings the Winter Soldier out of the woodwork. And can Frank stand up to the alien madness of WORLD WAR HULK? 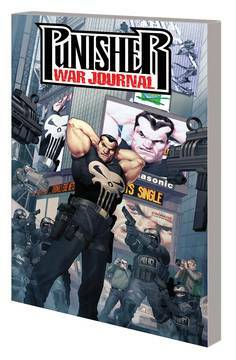 Collecting PUNISHER WAR JOURNAL (2006) #1-12 and #1 B&W EDITION. $16.99 This item will be released May 15, 2019. $17.99 This item will be released May 22, 2019.